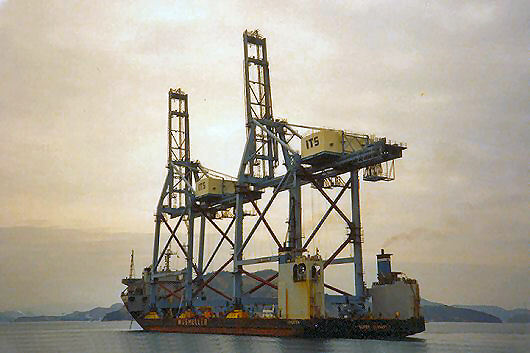 In March 1992, two Mitsui-built fourth generation (post-Panamax) container cranes were transported from Tamano, Japan to Long Beach, California on the SUPER SERVANT 1. The container cranes (each weighing approx. 850 t) were built with the boogies rotated 90 degrees. Using two 10 meter long steel link beams and rails on deck, the cranes were rolled onboard over the stern and secured to the deck with steel corner boxes. The booms were up during the transport, giving the cranes a total height in excess of 90 meters. In Long Beach, the cranes were rolled off over the stern, jacked up for rotation of the boogies and lowered onto their rails. Supervision of the offloading operation upon arrival in Long Beach, California.